During March, Wood Group plc will be bringing through Alyth the major components for the seven wind-turbines they are building up at Tullymurdoch. The turbine blades and support towers are very large items, so there will be temporary traffic and parking restrictions along both sides of the B952 Airlie Street and Bamff Road from its junction with Isla Road to its junction with the Alyth Den Car Park entrance. As I’m sure you’ll agree, economic success is good news for each and every business based in Perth and the region. A more successful economic area means more jobs, more visitors, increased investment, improved skills and more money in the local economy – which is something we’d all like to see. We have a fantastic set of assets, but we believe that much more needs to be done to raise the profile and image of the place to make potential investors, workers and visitors aware of our offer, with a view to securing more investment, stimulating more visitor spending and attracting more talent to the area. One of our priorities is to build on the success of previous work further with partner organisations and the business community to develop the ‘story’ for Perth and the region, identifying what makes us distinctive, and creating a competitive, coherent and compelling narrative and brand proposition that we can all use as ambassadors for the area. We would very much welcome your insight and opinions in support of this piece of work to help us shape that story by attending an interactive workshop to collect your insight, thoughts and knowledge of Perth and the region. We are holding three workshops during March, at different times of the day in different locations. We really hope that you will be able to attend one of the below workshops, and be involved in this exciting project. To register to attend please contact Jennifer McGregor on jennifermcgregor@pkc.gov.uk or 01738 475397. We very much hope that you will be able to be involved in this exciting project. Please do not hesitate to forward this invitation on to other colleagues who may be interested or want to be involved. Booking is now open for our Defibrillator Training Session, on 14 March at the Ogilvie Rooms, Commercial Street, Alyth, from 7.30pm until 9.30pm. Trainer Martin Fagan from the Community Heartbeat Trust will take you through what to do in an emergency and how to use the new publicly-available defibrillator installed in the ‘squinty’ phonebook on Market Square. If you know someone who’d like to attend but doesn’t have internet access, there are paper booking forms in the Library, Alyth Hotel, Cafe in the Square and The Singing Kettle. Or you can phone 01828 632816 to book a place. If you’re involved in building or maintaining paths in the outdoors, this could be for you. Paths for All are running a half-day workshop looking at how we can make our path networks more accessible to people living with dementia. Being active in the outdoors has many benefits for people living with dementia. It’s good for physical and mental health, can reduce social isolation and help maintain independence. However, there are still many barriers to people living with dementia being able to access the outdoors and greenspace in their day-to-day lives. This workshop will begin to explore some of the positive steps that we can make to involve people living with dementia in the design of our path networks. 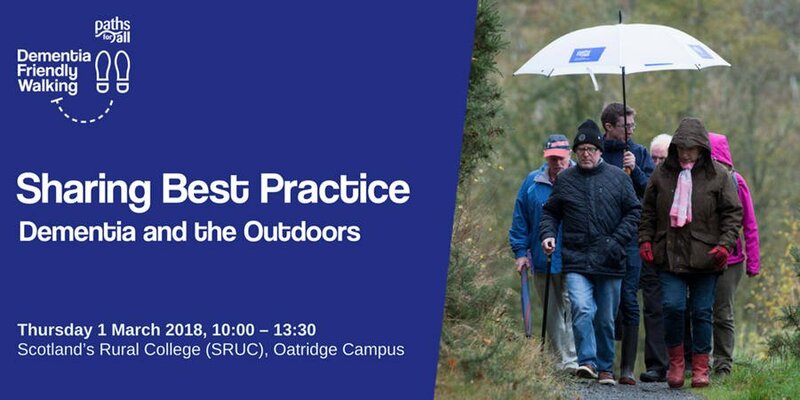 There’ll be speakers from the Dementia Services Development Centre at the University of Stirling, DEEP (Dementia Engagement and Empowerment Project) and Paths for All’s Dementia Friendly Walking team.